Situated in the heart of Chianti, halfway between the cities of Florence and San Gimignano, the farmhouse consists of an old country house, subdivided into eight charming apartments, an old deconsecrated Chapel converted into an Inn with 15 comfortable rooms, a restaurant reserved to own guests and a wine cellar where the farm produce and age own wines. Immersed in the peaceful countryside, sports and nature lovers can enjoy lovely walks along the paths of the estate or a swim in one of our two private pools open till late night (during summer). Every season will surprise you with its colours and scents. You will be welcomed by exquisite hospitality and by a bottle of Chianti! 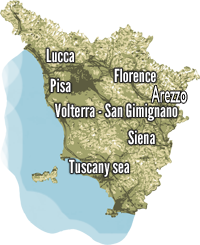 The commitment is assisting you throughout your stay, so that you will have an unforgettable holiday while discovering Tuscany too. The farm offer many activities and Last Minute ideas: oil and wine tasting, massages and well-being and beauty treatments, romantic weekends and gourmet evenings tasting the Tuscan cuisine or eating as much pizza as you like under a suggestive moonlight. The apartments are immersed in a peaceful garden, surrounded by lawns with roses and the olive trees and a stunning view on the hills. The apartments are located around the swimming pool that is reserved to the guests and equipped with deckchairs and beach umbrellas. Ideal for relaxing moments, it is open all day from May to the end of September and available for moonlight swims too. In the garden there is a gazebo with a big table and barbecue where You can share delightful moments. Beside the swimming pool there is a large shady veranda for moments of relax or to play ping-pong. The bowling green is just a few steps away and there is an equipped lawn to play volleyball. There is also a children playground with a slide and swing. Those who love walking in the countryside can decide to take a stroll along the many paths going up and down among the forests, or walk near the vines and olive trees of the property. Also at a few kilometres away, there are tennis courts and football fields, golf courses and riding schools. The reception is available to organise excursions to discover the territory and to make bookings for museums, guided tours of the art cities, shopping tours or customised itineraries to discover traditions and local productions. The direct sale is always open and guests can buy wines, extra-virgin olive oil in various sizes and the grappa. Wine tastings and tours of the farm and the wine cellar are possible upon request. Il prezzo totale comprende: Weekly change of bedroom and bathroom linen; water, electricity and gas (for kitchen), final cleaning; firewood for fireplace and barbecue; use swimming pool (opening mid may mid september). Bottle of wine!